Can I Use Shoe Polish on an Aniline Leather Couch? When you burnish something, you are making the object shiny using friction and pressure. Leather is usually burnished at the edges, such as on a belt, using a metal tool, like a spinning disk. 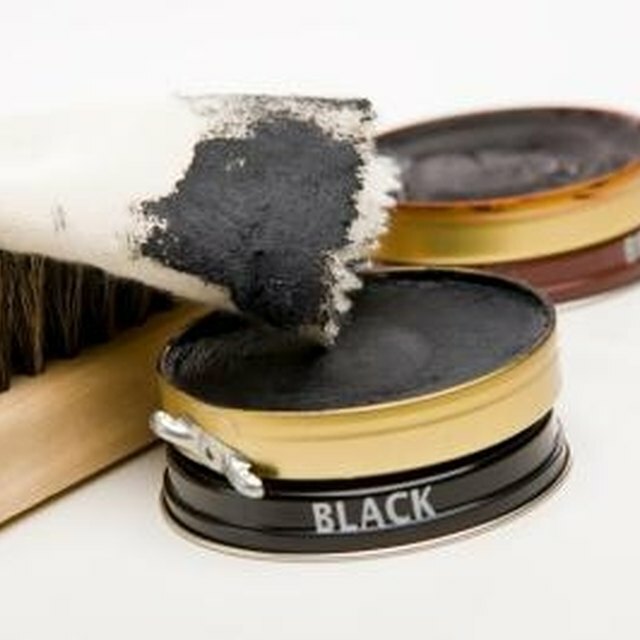 Burnishing is different than polishing as no polish is used in the process. Burnishing leather means to polish it without a polish. When you burnish something, you are making the object shiny using friction and pressure. Leather is usually burnished at the edges, such as on a belt, using a metal tool, like a spinning disk. Burnishing is different than polishing as no polish is used in the process. Leather must be fairly moist when burnishing, but not wet. Clean the leather thoroughly before burnishing. You don't want to rub debris or dust into the leather while working on it. This could create damage you can't fix. Make sure that the edges you intend to burnish have been cut with very sharp tools. Dull tools can leave behind fibers that will become fuzzy as you try and burnish them, resulting in an unattractive edge. Apply gum tragacanth to the cut edge of your leather piece. Gum tragacanth is an odorless, water-soluable mixture from the sap of legumes native to the Middle East. The substance helps fill the fibers, according to leatherworker John Coxon. Dampen the leather, but don't let it soak. Use a wet sponge or rag and wipe the item several times until it's damp. Large pieces can be soaked in water for about 30 minutes, but not longer than that. The amount of water needed does take some practice depending on the thickness of the leather. Use a smooth piece of cylindrical wood or a burnishing pad for a rotary tool or drill to burnish the edge. The wood can be a size that is comfortable for you, such as a chopstick or a larger dowel. The pad needs to be attached to the drill or rotary tool. Continue to rub the edges until you hear a "sticky clicking sound," according to Coxon. The burnisher needs to stick to the leather to give it some resistance. If the leather is too wet, it won't make the sound and nothing will happen. Let the leather dry out for a little while and try again. Do I Have to Sand Stained Woodwork Before Priming & Painting it? What Tools Are Used to Burn Images Into Leather?